Tom Dundee gave a public speech at a protest and will now spend 10 years and 10 months in prison. The military controlled courts in Thailand are using their power to quiet any dissent. Let's make sure freedom of expression is more powerful than intimidation. Tom Dundee, a Thai country and blues singer, will spend 10 years and 10 months in prison for insulting the monarchy and computer crimes. He gave a speech in November of 2013, at a pro-democracy protest which the military court determined to be insulting to King Bhumibol. 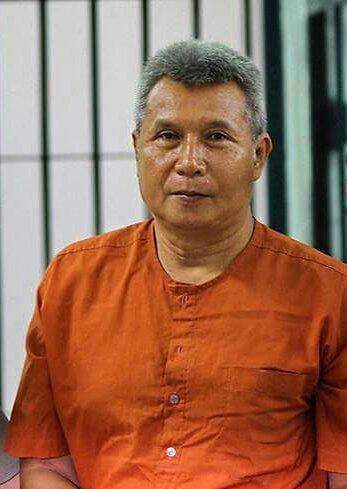 His imprisonment is part of a larger trend of prosecutions by Thailand's military after it seized power in a coup in 2014. The military, self-appointed representatives of the King, have full control and a zero-tolerance approach to criticism of the monarchy. They invoke lèse majesté law to achieve guilty rulings in questionable trials, and sentences are becoming increasingly harsh. This punishment is a clear violation of freedom of expression rights that the King himself has recognized as foundational to any modern society, as recently as 2005. It’s time to joinTom Morello in speaking up for those with the courage to speak out against oppressive regimes. 100% of the proceeds raised from this shirt will go to The Voice Project to help them as they work for the release of Tom and the other artist-activists who have been imprisoned around the globe for speaking out. More information on Dundee and the Voice Project's "Imprisoned for Art" campaign is available here.